german chocolate swiss roll cake — Mel bakes things. Ya'll, it is just straight up swampy outside. The humidity is at 79%, which is just rude. The nice thing about this adventure was that there's not a ton of work involved. The filling has to be made ahead of time and refrigerated, and the cake and whipped cream both take minimal effort. In an effort to keep it real, I'll tell you this: this is NOT the dessert to make on a hot/humid day. I could not get my eggs to be as fluffy as they should've been before adding the rest of the ingredients, which is why the cake layer looks so thin (although it was still quite tasty). And because heat and humidity are flat out evil, I also had one hell of a time getting whipped cream to stay whipped. It just kept melting and turning into a sad, gloppy mess. 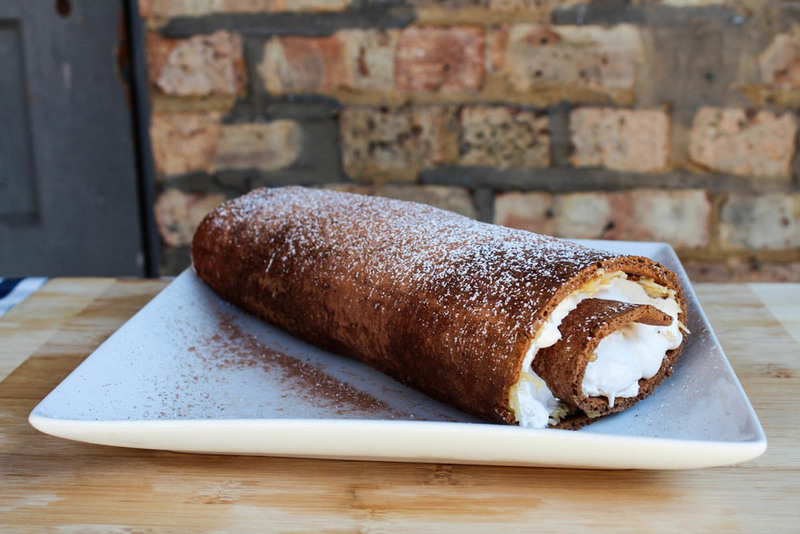 What you see there, unfortunately, is cool-whip (and even the cool-whip is a little melty). Yeah yeah, I know. But it was either that, or have a runny mess. Even with the cool-whip, it was still delicious. And I'd still prefer cool-whip over a cake filled to the brim with buttercream frosting. There are all sorts of flavor combinations out there...if you're interested in trying this out, I'd say explore some of the other flavor profiles and mix and match your recipes based on what sounds good to you. Preheat the oven to 350F and grease and line a 9 x 13 inch jelly roll tin with parchment. Place the eggs, sugar and vanilla extract in a large bowl and whisk with an electric mixer until the mixture is extremely pale and creamy, around 5 minutes. Add the oil and milk and gently fold through with a metal spoon or spatula. Sift in the flour, cocoa and salt and fold through gently, being careful not to knock too much air out of the whisked eggs. Pour the mixture into the prepared tin and tilt to distribute evenly. Bake for 10 to 15 minutes, or until the cake has shrunk back a little from the sides and springs back when touched. 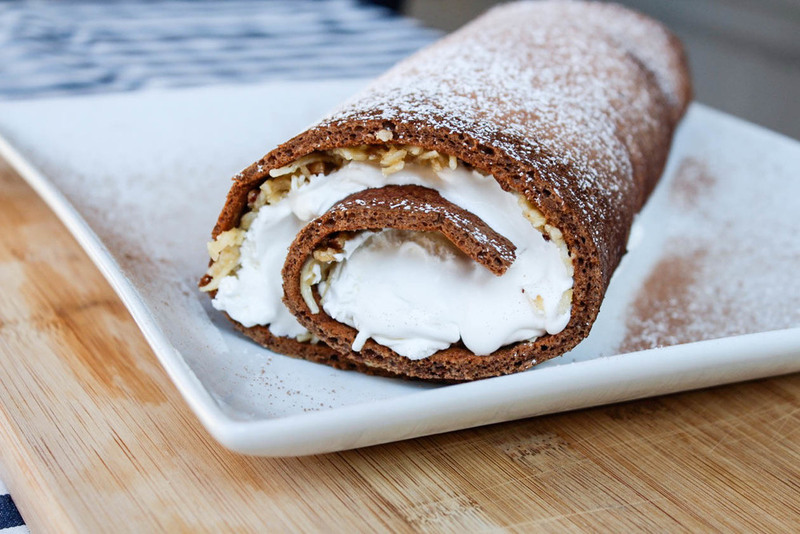 **A note: I've seen several different methods for preparing the cake portion of the swiss roll/roulade...if anyone's tried anything different, I'd be curious to know what your results have been like! Whisk yolks in medium saucepan. Gradually whisk in evaporated milk. Add sugars, butter, and salt and cook over medium-high heat, whisking constantly, until mixture is boiling, frothy, and slightly thickened, about 6 minutes. Transfer mixture to bowl, whisk in vanilla, then stir in coconut. Let the coconut filling sit out for a few minutes until it becomes stir-able, then stir in the pecans. Prepare your whipped cream (you can use your favorite recipe)...you'll probably want at least 2 cups, and you'll want it to be firm. You don't want it all squishing or melting out the sides when you roll the cake. Unroll the cake. Spread the coconut-pecan filling over the cake, and then spread the whipped cream on top of the filling. Dust with cocoa powder and/or confectioner's sugar. Slice with a serrated knife (like a bread knife), and serve!